Students - I got the idea for today's poem from an assignment! Sometimes here in the blogosphere, people share ideas of things to try. This week at Connecting the Dots, David Harrison guests who propose writing things-to-try. Well, earlier this week, J. Patrick Lewis introduced the idea of "careerhymes." To write one, you simply think of a career and write a light poem about it, including the name of the job in the first line of your poem. There are many examples over at Connecting the Dots, including one I wrote about a dog walker. But after reading so many and looking at the piles of snow around here, I wanted to write another. Do you ever think about what grownups used to be like? That's what was fun for me with this poem. First, I wrote the first stanza...but then, I just needed to keep going. 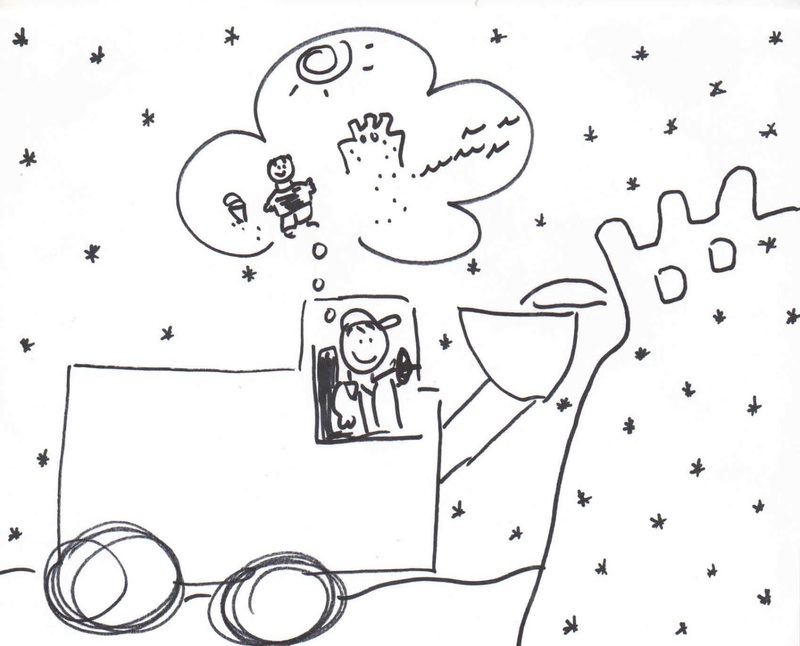 The idea of a snow plow driver as a young boy got into my head, and I imagined him building, building, even then. 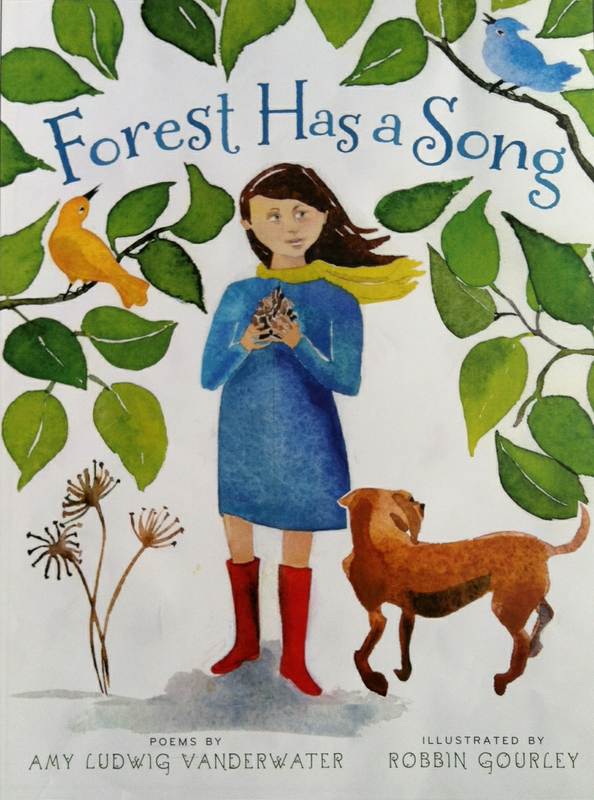 I am very very happy to welcome Amy Zimmer Merrill to Sharing Our Notebooks this week. If you love notebooks...you will adore her post and lovely giveaway. 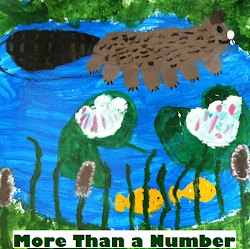 Please share this one with your notebook-keeping students. It's always inspiring to peek into the notebooks of others, and Amy makes me want to grab my glue stick and go to town! Happy happy birthday to No Water River! 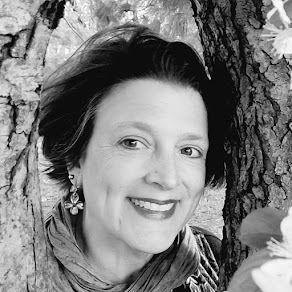 Renee is celebrating her glorious blog's birthday today as hostess of Poetry Friday! Head on over to see some funny bloopers, catch her spirited joy, and visit all of this week's poetic offerings. Adorable poem, love the pillowed roads :). Such fun seeing everyone's careerhymes. the images are wonderful, Amy, like 'winter's gown". I never imagined a snowplow driver to have such a romantic career before. Terrific that you carried that 'assignment' even further. It was fun, wasn't it? I'm glad you gave the back-story in the second Stanza! Wonderful poem, Amy! 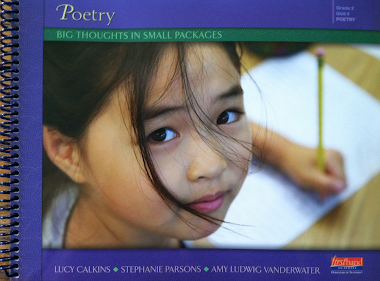 I too love the imagery in this poem, "pillowed...lacy...gown." Beautiful words that soften the whole stanza. Lovely. I've been thinking about those mountains of snow (now shrinking in our 50-60s)...they might melt before I get to poemize them! 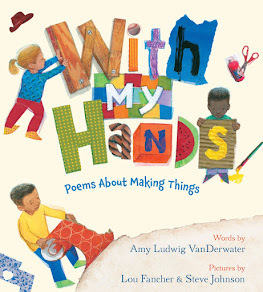 Love your poem, Amy! I,too, love the pillowed snow and turning our flakes into castles. There is such delicacy in that first stanza - and what a concept: careerhyme poems! 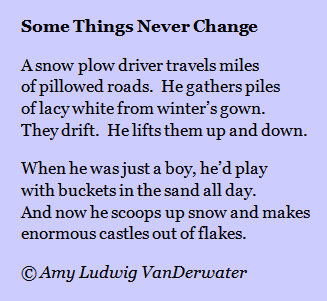 We just read the poem Some Things Never Change about someone who liked building sandcastles as a young boy and now likes to make piles of snow as a snow plow driver.We are going to start learning about careers after our February break. We will be trying some "careerhymes" for that unit!